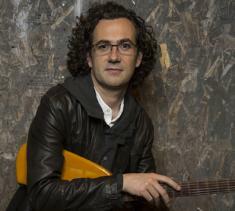 Spanish-American guitarist Oscar Peñas will bring his newest musical oeuvre Almadraba to Aaron Davis Hall for two concerts presented by City College Center for the Arts (CCCA) at 7 p.m. on Thursday, February 7, and Friday, February 8. A fascinating mix of the jazz and classical worlds, the Almadraba suite performed by the Oscar Peñas Jazz Quartet joined by the Mivos Quartet string ensemble offers a tribute to the musical milieu in which Peñas was raised and a classic Spanish fishing tradition. Originally from Barcelona, Peñas has garnered acclaim as a guitarist and performed with stars of the jazz world including Ron Carter, Paquito D'Rivera and Esperanza Spalding. Born to a family that exposed him to Spain's traditional, folk and flamenco music, Peñas first studied classical music before developing a passion for jazz. A celebrated musician, composer and arranger, he has released four studio albums including From Now On (2011) and Music of Departures and Returns (2014), which JazzTimes noted as providing music fans with "a joyful and playful feeling." Almadraba, Peñas' suite of original compositions inspired by and named for the technique of capturing bluefin tuna practiced in the Andalusian region of Spain for more than three millennia, will reel audiences in. A 12-part suite, the work reflects his Iberian heritage and his masterful ability to blend those roots with jazz, classical melodies and the music of Latin America. Pieces in Almadraba include "Traveling Through Water," an ode to the journey of the fish toward the warm waters of the Mediterranean; "La Levantá," whose energetic melodies flow in accordance with the arduous labor of the fishermen, or almadraberos; and "Calamento," named after the intricate, maze-like process of staging the nets needed to ensnare the fish. A studio recording of Almadraba is currently in the works and will be released at a later date on Peñas independent music label, Musikoz. "If Almadraba can musically transport CCCA's audience to the magnificent coast of Cadiz, my mission as a composer will be accomplished," said Peñas. Tickets are $20 general admission and $10 for students and seniors with valid ID and can be purchased online at www.citycollegecenterfort... or in person at the Aaron Davis Hall box office Tuesday through Friday from noon to 6 p.m. For more details, visit the CCCA site or call the Aaron Davis Hall box office at (212) 650-6900.